If you’re like me, you have a pile of miniature figures and battle maps that don’t get nearly the amount of time on the tabletop as you’d like. And you have dice… so many dice, of different shapes and colors. Some unique dice with unusual faces — but most of them are the types seen in so many role playing games: d4 through d20. In USR, only the d6, d8, and d10 are used (also the d12 in a Domino Writing-style superhero game). But what if you don’t have those dice at hand? 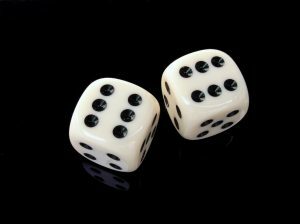 Unlikely, since if you’re reading this you undoubtedly have gaming dice, or at least access to a free die-rolling app. But I’ve roleplayed on a backpacking trip, and when on a trip away from home in the pre-cell phone days, when the only gaming material on hand was a deck of playing cards and a partial Monopoly game. Monopoly has tokens you can use as miniatures, and more importantly for our purposes it has two six-sided dice, or 2d6. As you can see, you’re more likely to see higher results than with ordinary USR dice, especially after adding in Specialisms, weapons and armor. It also doesn’t work if you need to roll a critical success (highest result on the die) or critical failure (lowest result on the die), as the odds of rolling each are very skewed. This option isn’t really meant to replace the standard rules, but instead fill in when needed. If you are okay with forgoing the satisfying thunk of dice one can draw chits. Write the numbers on them and draw from a bag.